Welcome back to my blog! This week the Stampin’ Up Artisan Design Team is featuring another new set of projects using supplies from the Spring Catalog in our blog hop. You might have just arrived from Jeanna’s blog. If not, go back and look at her cute, creative project! I have two things to share today, a scrapbook page and a card. I first made the bottle caps for the scrapbook page, but I decided maybe they were a little too thick for the page. After the fact, I saw Sarah's great tip on our Facebook projects for running them through the Big Shot to flatten them down a bit! But, in the end I decided to use the Silver Basics Designer Buttons on the layout and use the bottle caps on a card instead. Here is the scrapbook page. I've discovered that I really like to start my pages with a neutral colored background. I actually learned that about myself by looking at a lot of the scrapbook pages that I was pinning to my Scrap It board on Pinterest! It's good for spotting things that you like, even if you aren't conscious of them. My first draft also had some splattered ink on the background, but I went a little overboard and decided it looked like my page had the chicken pox! That's not a good look, so I started with a clean background. I used a stamp greeting for the title, and page about me starting the process of getting a certification in my field for my day job. Feel Goods is rapidly becoming one of my favorite stamp sets! It feels good to get the story down on paper. I did ink a couple of items using a mix of rubbing alcohol, Pool Party refill ink and our Stampin' Spritzers...love them! I used this spray ink for the doily below. I layered the doily with a scallop circle punched piece of the Summer Starfruit pattern from the Sycamore Street Designer Series paper, then a border of the Rich Razzleberry pattern, a strip of Pool Party Seam Binding Ribbon stitched down and covered with a Silver Basics Designer Button stitched with Pool Party Baker's Twine. Here is the title stamped from the Feel Goods set onto a Pool Party tag, with a die cut edge (Finishing Touches Edgelits Dies) and an embossed edge (Needlepoint Border Textured Impressions Embossing Folders). I also added some cross stitches with linen thread and the new Paper Piercing Tool. I printed my journaling on a piece of vellum cardstock, which works really well by the way. But, it was a little to see-through over the patterned paper. So, I cut a circle from the Creped Filter Paper, sprayed it with my Pool Party spritzer and backed the journaling with it. I love how it turned out! So, onto the card. I stamped images from the Collage Currious set on Whisper White Cardstock, covered them with Versamark Ink and then embossed them with Clear Stampin' Emboss Powder. I think this helps keep the ink from bleeding for the next step. I put a little Crystal Effects in the bottom of the Bottle Caps, put the punched out stamped images inside the Bottle Caps (I used the 1/2" and 1" Circle Punches) and filled them with more Crystal Effects. I had to wait overnight for them to dry, but they were worth the wait! Here is a close-up of the bottle caps. I also used a new Single Stamp called Basic Label and the greeting from the Sale-A-Bration set Pretty Petites. I also paper pierced around the diecut patterned paper, and finished the whole thing off with 7/16" Natural Trim Ribbon and some Linen Thread. Well, that is all for today. You will find the supplies listed below. I’ll have some more Sale-A-Bration samples to share with you later this week. You’ll want to join us again next Wednesday as we feature another hop with our latest round of Facebook Projects! And, don’t forget to click to get to Sarah’s Blog for the next stop on the hop. You won’t want to miss her beautiful and creative project. Thanks for stopping by! Welcome back to my blog! I had some time this weekend to get my craft on, so I made some projects for challenges and magazine submissions. Today, I am sharing a card I made for the Freshly Made Sketches Challenge #74.I have been wanting to play with the Canvas Creations sheet from Stampin' Up. So, I die cut it using the Top Note Stampin' Up! Bigz Die. Then, I stamped the greeting and chevron design from the Oh Hello stamp set using Whisper White Craft Ink, and embossed it with white embossing powder. Then, I dipped the canvas piece in an alcohol/ink mixture using So Saffron ink for the top half and Pretty In Pink ink for the bottom half. As I was dying the piece, I overlapped the areas so it would have a nice coral color in the middle. I stitched some patterned paper from the Tea for Two Designer Series Paper to the card front using my sewing machine, and then added white mini-brads to the canvas piece to help attach it to the card front. Here is the sketch I started with. Lots of possibilitites here! Here is a close-up of the stamped and embossed image. I also used So Saffron 3/8" Taffeta Ribbon and some Pretty In Pink/Calypso Coral died 5/8" Flower Trim for the roses in the lower right corner. One last close-up of the card front. Well, that's all for today. I'll have some more Sale-A-Bration samples to share this week, and the Artisan Design Team will have their Wednesday Wow Blog Hop on...Wednesday! Thanks for stopping by! Welcome back to my blog! Today I am sharing the last of my projects using the Patterned Occasions Stamp Set from Sale-A-Bration. I made a little scene for the elephant using Summer Starfruit Cardstock, and one of the Sycamore Street Designers Series Papers. The elephant is stamped and trimmed out, and I popped up a second ear with Stampin' Dimensionals. The greeting was colored with a Stampin' Write Marker on Whisper White Cardstock, and die cut with the Bitty Banners Framelits Dies. Here is a close-up of the card. I added some faux stitching with the White Signo Gel Pen, and a Rhinestone Basic Jewel for the elephant's eye. Well, that's all for today! Come back tomorrow for some more Sale-A-Bration samples! Thanks for stopping by. Welcome back to my blog! Today I am sharing another sample from Sale-A-Bration supplies using the Patterned Occasions Stamp Set which is free with a $50 purchase. I decided to make a little pouch to hold an instant coffee packet. The packet is made from Rich Razzleberry Cardstock, with rounded corners and a curved edge that I also dry embossed along. I added little punched flowers and Silver Mini Brads. I colored the coffee stamp with Stampin' Write Markers, and used the Apothecary Accents Framelits Dies to trim it out and the Essentials Paper-Piercing Pack to highlight the edge. Then, I mounted it on a piece of the Sycamore Street Designer Series Paper die cut with the Window Frame Collection Framelits. Can't stop using them! Here is a close-up of the project. It is a little easier to see the cute heart-shaped "steam" that is rising from the cup. Love this set! Don't miss the chance to get yours for free with a $50 purchase until March 22nd. Welcome back to my blog! I have some more Sale-A-Bration samples to share over the next few days. I am starting with a card using the Patterned Occasions stamp set today. I love this little cupcake image! Plus, this is my new favorite color combination. I love Pool Party, and it looks great with Summer Starfruit and Rich Razzleberry...the colors really pop together! 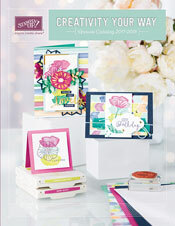 The card background has the text patterned paper from the 2011-2013 Designer Series Paper Stack. I colored the cupcake image with Stampin' Write Markers, and die cut it with the Window Frames Collection Framelits dies. It is layered onto a paper-pierced circle and then another Window Frame Diecut from the Sycamore Street Designer Series Paper. I separated the greeting from the stamp onto a separate banner die cut with the Bitty Banners Dies. Here is a close-up of the card front. I also used a Rich Razzleberry button from the Sale-A-Bration Sycamore Street Ribbon and Button Pack. Sale-A-Bration is on until March 22nd, so be sure to get your free products with a $50 order before they are gone! Well, that is all for today. Come back tomorrow for another Patterned Occasions project. Thanks for stopping by! Welcome back to my blog! This week the Stampin’ Up Artisan Design Team is featuring a new set of projects using supplies from the Spring Catalog in our blog hop. You might have just arrived from Jeanna’s blog. If not, go back and look at her cute, creative project! For today's card, I decided to pull out my watercolor paper and use some of the same colors and patterns from the Parker's Patterns Designer Series Paper. I dropped ink into the lids of my stamp pads rrom the reinkers, and picked it up with my Aqua Painter. I painted narrow stripes with rough edges using Daffodil Delight, Cherry Cobbler and Not Quite Navy inks. I also chose one of the striped pattern papers to compliment my design, and trimmed about a 1.5" strip. Both the watercolor piece and the striped piece were matted with Not Quite Navy Card Stock, and adhered to a Whisper White card base that is 5 1/4" x 5 1/4". For the focal point, I stamped the Just Thinking stamp in Not Quite Navy ink onto Whisper White card stock, and just trimmed it out by hand close to the border. I die cut a frame from Not Quite Navy Card Stock using the Window Frames Collection Framelits Dies, and adhered the stamped greeting to this piece. I added a Large Rhinestone Basic Jewels to the image. To finish, I adhered two of the large Silver Basics Designer Buttons to the card front, and then mounted the stamped greeting using Stampin' Dimensionals. It's a bold look, and something different for me! Using the Parker's Patterns papers has definitely pushed me out of my normal design "comfort zone"...in a good way. Well, that is all for today. You will find the supplies listed below. I’ll have some more Sale-A-Bration samples to share with you this week. You’ll want to join us again next Wednesday as we feature another hop with all new projects! And, don’t forget to click to get to Sarah’s Blog for the next stop on the hop. You won’t want to miss her beautiful and creative project. Thanks for stopping by! Welcome back! Today, I have a card to share using the Moving Forward set. $2 from every sale of this set goes to the Ronald McDonald House charity. So when you purchase this set, you get some cute stamps and do some good at the same time! This card reminds me of spring, and sunny, cheerful weather. I am definitely in the mood for that after all the cold, gray weather we've been having around here. I trimmed green patterned paper into two different hills. Then, I trimmed white cardstock for the sky, and ran it through the chevron embossing folder. I drew faux stitching along the inside edges of the hills and sky with a blue marker. I made a card from white cardstock. I mounted the bottom hill to card, then mounted the top hill and sky with dimensional adhesive to the card. I stamped the tricycle in blue ink. I colored the flowers with markers, and stamped them more than once. I adhered clear jewels, and colored with a marker. I colored the banner stamp outline with a marker, and stamped. I colored the greeting and stamped on the banner image. Lastly, I die cut the banner, and adhered it to the top of a toothpick, adhering the banner to the card. Well, thanks for stopping by. Please join me again in two days for the Artisan Wednesday Wow Blog Hop! Happy Valentine's Day! I can still say it for a couple more hours at least. I made a quick Valentine's Day card in My Digital Studio to share today. I hope you enjoy it! I had a picture of some watercolor hearts in a big bunch falling across the card, and this is what I came up with. I used a heart punch and the papers from the Convention 2012 Digital Kit Papers, which are turned down to 80% opacity. The greeting is from the Candy Conversations Stamp Set stamped in Basic Black also at 80% opacity. Here is the inside of the card, using only the Candy Conversations Stamp Set. I sampled the colors from the card front to color the candy hearts here, and also stamped the greeting in Basic Black at 80% opacity. Well, that is all for today. I hope on this Valentine's Day you feel loved and appreciated! Thanks for stopping by. Welcome back to my blog! This week the Stampin’ Up Artisan Design Team is featuring a new set of projects using supplies from the Spring Catalog in our blog hop. You might have just arrived from Jeanna’s blog. If not, go back and look at her cute project! I decided to start with a couple of cards using the Feel Goods stamp set. I really like this set…love the fonts, love the sayings, love how it looks when it is stamped. It makes a great focal point. So, I got this idea from a picture of a park sign that I have hanging in my loft. I decided to see what a greeting from this set would look like hung from above like a park sign would be. And, with chalkboards being so trendy, I had to use that as well. I started with a rectangle of Basic Grey card stock, stamped the greeting in Versamark Ink and then embossed it in White Stampin’ Emboss Powder. Next, I cut a rectangle from woodgrain pattern of the Natural Composition Specialty Designer Series Paper, and used a craft knife to cut out the middle to make a frame. Before attaching the frame, I stamped the floral sprig from the Tiny Tags set in Whisper White Craft Ink. I set the ink with a heat gun (so I could move on without smudging it). I glued the frame down, and then drew in a border with the white pencil from the Watercolor Pencils set. The card is made from Whisper White Card Stock, with the chevron pattern from the Parker’s Patterns Designer Series Paper attached to the front. The wood skewer is cut to size, and attached with some Mini Glue Dots. Then, I attached the greeting with Stampin’ Dimensionals. I also wrapped Linen Thread around the skewer twice and through the sign twice to add to the look and to keep the skewer in place. And, that’s all she wrote for card #1. I got the idea for card #2 from the greeting itself. Have you used the Canvas Creations sheets yet? You have to try them…they are a lot of fun. I stamped the greeting on a scratch piece of paper that I had die cut into a 3” circle. I picked a point under the word “Sunshine” for the rays to emanate from, and drew a point there. I drew one line through the point that divided the circle in half, and drew 4 more lines through the point trying to make them as even around the circle as possible. I cut out every other section using a craft knife. To stabilize it for sponging my ink, I taped it back into the piece of paper that I had die-cut the circle from. I laid it over a 3” circle die cut from the Canvas Creations sheet, and sponged Daffodil Delight Ink from the outside of the rays to the center. I wanted to leave the inside with less ink for a gradient effect and so the greeting was easier to read. I stamped the greeting onto the inked canvas with Early Espresso Ink. I held it down for a few seconds so as much ink as possible would transfer to the canvas. I die cut one more 3” circle from a square of Daffodil Delight Card Stock, and I cut it and another piece using the Window Frames Dies. I paper pierced around the frame piece using the Festive Paper-Piercing Pack. I adhered the canvas piece to the full Daffodil Delight piece, and adhered the other frame piece over the top with Stampin’ Dimensionals. The card front is Whisper White again, with a piece of Daffodil Delight card stock under a piece of the Not Quite Navy pattern from Parker’s Patterns DSP. I wrapped those two layers with the Natural 7/16” Trim Ribbon and tied the ends with Linen Thread. Then I mounted the greeting over the top with more Stampin’ Dimensionals. Well, that is all for today. You will find the supplies listed below. I’ll have some more Sale-A-Bration samples to share with you this week. You’ll want to join us again next Wednesday as we feature another hop with all new projects! And, don’t forget to click the logo below to get to Sarah’s Blog for the next stop on the hop. You won’t want to miss her beautiful scrapbook page and see what she did with the Designer Builder Brads. Thanks for stopping by! Tonight I have a quick card that I made in MDS. What, Marisa made a digital card? I know, pick yourself up off the floor and keep reading.I have had the idea for this card running around in my head for awhile. The song lyric from the Beatles came to mind, and all I could think about was using an alphabet punch with the pretty papers from the More Amore collection for the words "love". I will share the digital version here for now. I am planning to print this out, and will try to share the printed version here soon as well! It seems that maybe when I create digital projects, my inner "clean and simple" style comes out. Who knew?! The background is Pool Party at 50% opacity, and I used the Alphabet Soup Punches with the More Amore Designer Series Paper. I gave some shadows to the Alphabet Soup Punch letters as well. And, here is the inside of the card. I used an oldie but goodie stamp brush set for the inside, Always. Well, that is all I have for today! I'll have a couple more digital projects tomorrow using the Sale-a-Bration digital discs, and then back to some projects using the Patterned Occasions stamp set. Thanks for stopping by!